The impossible possum predicament 4 months ago When CJ and I came back from celebrating the New Year in Sydney, we were very happy to find our garden in Martinborough in a gorgeous state. We thought the year was off to a fine start. Little did we know how quickly that would all change. Pig breakfast! 1 year ago Readers have been asking for videos of the pigs. So join me as I feed the pigs breakfast. New year greetings from the olive grove 1 year ago Wishing you a happy 2018! 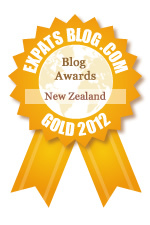 ExpatsBlog.com Expat Blog Awards 2012: New Zealand Gold Award! This blog won the Gold Award for best expat blog in New Zealand! I've loved reading this blog from the very first time I stumbled upon it - the posts have made me laugh and made me cry. And I've also learnt to make the meanest carrot cake, ever. 5 stars only?! I reckon Moon over Martinborough and Jared should get 10 stars! I'm a confirmed fan. I love the happenings at MoM. Wonderful blog! I really enjoy the way in which is written! Even though we are "almost" neighbours I love reading Moon Over Martinborough's blog - he has a wonderful way with words, and the love for his feathered and sometimes woolly friends comes shining through. The photos are always stunning. Inspiring, charming and uplifting. Yes, I vote for them! I love reading Moon over Martinborough blogs as they are such interesting stories covering a multitude of subjects with love and humour obviously written by a kind and caring person. I am waiting for all his writings are published in a book or even two! 10 stars at least. Jared is a wonderful story-teller and writer - who clearly has a unique view of living a rural life. He charmingly expresses special moments with innocence, guts and obvious genuine affection. Those boys are living the dream, and thankfully sharing all the drama! I have been hooked on Moon Over Martinborough since I first stumbled upon it last year. Out of the dozens of blogs I follow, I am always very excited when a new post appears there! Jared's writing voice is very unique, and never fails to make me feel like I'm right there living their adventures on the farm. I can't wait for the book! I have followed Moon Over Martinborough for several years now. I always look forward to hearing about Jared's latest exploits, it's kind of like Tales of the City but set in rural NZ! They are living the life so many of us city slickers would love to be brave enough to embrace. Jared has the amazing skill of drawing the reader into his rural life adventures. His words bring laughter and sometimes tears as we travel along with him. When the moon is full, I know it is time to check MoM. This is absolutely, by far, my favorite blog! The stories are laugh out loud funny and Jared can make anything from escaped animals, hungry chickens, baby lambs, or harvesting olives sound like the greatest of fun. I love the writing and their olive oil is the best too! Two thumbs up for Moon Over Martinborough!! I love it! Jared's writings have been fascinating reading for me each and every time. Jared's has a great talent for sensing the heart and soul of each situation, each human, and each animal that becomes a part of each marvelous story. After sensing the heart and soul, he then has the ability to transform the essence of the moment into words that connect with the heart and soul of the reader. Moon over Martinborough is very worthy of the Expats in NZ Blog Award. I love this blog. Reading the posts let's me imagine that I am there in New Zealand (where I've only visited, but hope to return someday) The writing is warm and real. This blog is amazing. I feel as though I have experienced many NZ adventures without ever having left my USA living room! I really enjoy reading this blog and eagerly await each months installment. LOL! Love reading the latest adventure. Jared's writing always makes me laugh, and occasionally makes me cry. Love this blog, it's real and it's fun. Jared is an engaging, entertaining, first class storyteller. He captures stories with the kind of mindfulness that slows the world down long enough for emotion to burst through and delight us with laughter and tears. Long may he and the moon shine. Jared is an amazing writer, engaging blogger, and a wonderful person. His writing has an easy style that just seems as if you reading with an old friend. What he makes seem effortless is, I know, a rare talent. An absolute favourite.